Myth: Second-cutting hay is always the best. How it came about: The No. 1 factor determining hay quality is stage of maturity at harvest. Cool-season grasses such as orchardgrass and timothy will produce a seedhead in the spring, often just in time for the first cutting. For the hay producer, this means an increase in yield and therefore more bales that can be harvested and sold. However, this also means that the crop's fiber is elevated, reducing quality. Because seedheads are only produced once a year in cool-season grasses, subsequent cuttings do not contain seedheads and second or later cuttings will result in less fibrous hay. Truth: First cutting hay can be high-quality if cut early. Stage of maturity and other management factors affect hay quality at harvest. High-quality (or low-quality) hay can be harvested from late spring to late fall if weather and management conditions are right. Quality should be assessed on laboratory-performed analysis and not on cutting. Myth: Horses require higher-quality hay than cattle. How it came about: In general, horses do require higher-quality hay than cattle because their digestive tracts are very different. Cattle are ruminants (have four compartment stomachs that allow them to ferment and rechew forage) and are able to break down fiber very efficiently, whereas horses are monogastrics (one compartment stomach) and are less efficient at fiber digestion. Therefore, cattle can perform well on hay that horses can’t. Truth: The animal's individual needs should dictate the quality of hay provided. An easy-keeping Quarter Horse in light work does not need the same quality of hay as a Thoroughbred at the peak of his or her racing career. Similarly, an open (nonpregnant) Angus cow does not need the same quality of hay that a high-producing dairy Holstein needs at the peak of lactation. Consider your horse's current body condition, work level, and pasture availability before choosing hay to best meet your horse's needs. Base this choice on a hay test. Myth: _________ is the best type of hay. How it came about: Statements such as this often come from horse owners who have moved from one area of the country (or world) to another and are not accustomed to the local hay. Forage species used for hay will fall into one of two categories: grasses or legumes. Grasses can include orchardgrass, tall fescue, Bermudagrass, timothy, teff, and smooth bromegrass. Legumes include alfalfa and red clover. Truth: Hay quality is not about the forage species or even the variety. When managed and harvested correctly, legumes will be higher in quality than grasses; however, there will be little difference between different grasses or legumes when all other factors are held constant. Buying quality hay produced locally will likely save money because of the reduced transportation costs. Research any concerns you might have about a specific grass or legume species, such as endophyte-infected tall fescue. If you are concerned about feeding a certain hay species, consult your local county extension agent or an equine nutritionist. Myth: Round bales or silage contain diseases such as botulism and should not be fed to horses. How it came about: The botulism bacterium prefers moist conditions and is commonly found in soil, stream sediments, and in the intestinal tracts of fish and mammals. Silage by definition is stored with higher moisture than hay and when not properly handled, can allow the botulism bacterium to flourish. Round bales are often baled at a similar moisture content as small square bales, but are more likely to be stored outside where they can get wet from rain, therefore encouraging bacterium growth. Truth: Proper storage, handling, and feeding of round bales and silage will minimize botulism risk. Cover round bales when stored and feed them using a hay feeder to reduce contamination from trampling and urination. Do not feed round bales that show clear signs of mold to horses. Feeding silage to horses is much more common in other countries than in the United States. Silage should be put up at the proper moisture content for the style of storage, kept airtight until feeding, and fed quickly to reduce the risk of botulism. Always test silage for forage quality before feeding. In botulism-prone areas, routine vaccination will often include a botulism immunization to protect horses. Myth: Don’t feed hay that has been rained on. How it came about: Rain affects hay in a variety of ways. First, rain on recently cut hay can prolong plant respiration and reduce energy content. Second, rain on legumes will cause leaves to separate from the stems (called leaf shatter) and therefore remove the plant's more nutritious portion. Fibrous stems will then be more concentrated in the final product, causing a decrease in quality. Third, rain will also cause leaching of sugar and other carbohydrates, proteins, and minerals. Truth: Rained-on hay can be acceptable quality. While rain usually negatively affects hay, to what degree depends on several factors, including what type of hay is being harvested, how much/how intense the rainfall, stage of curing when it rained, and what the producer has done to counteract these negative effects. For example, if rain occurs within a day of cutting, it has very little effect on hay quality. 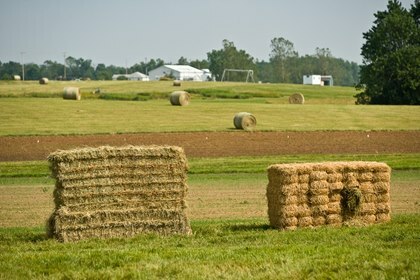 Test all hay, especially material that has been rained on, for quality and inspect it for mold or dustiness before use. Myth: Hay should be stored for six weeks before feeding. How it came about: This myth likely came about from hay testing. After hay is stored in a barn, it will continue to cure for four to eight weeks. This means the hay quality can change slightly over this time before it becomes stable. Truth: Hay can be fed at any time after harvesting. To increase a hay test's accuracy, do not test the hay until it has been stored for six to eight weeks. While feeding hay sooner will not be harmful to horses, it will be difficult to balance the ration because the quality is unknown. Myth: Green is good and brown is bad. How it came about: Hay that has been harvested too late or mishandled will often lose its green color due to processes such as heating and bleaching. Green hay is less likely to have gone through these processes and more likely to be of quality. Truth: A hay test is the only way to truly evaluate quality. No quality factors directly affect color or vice versa. Therefore, color is an inconsistent factor to evaluate hay quality. Myth: Feeding hay causes a large, distended digestive tract, known as a hay belly. Truth: A balanced ration that includes quality pasture or hay will maintain a horse at an ideal condition without excessive gut fill. Forage, whether in the form of pasture or hay, is an important component in the equine diet. Choosing hay for your horse will depend on his current condition, work level, pasture availability, and the logistics of management on your farm. Always inspect hay and make sure it's free from contaminates such as weeds, insects, mold, dust, and other foreign material. And always test hay before feeding it to ensure the total ration is balanced and can meet your horse's needs. For hay testing information, contact your local county extension agent.